Summary: Oil painting showing three Putti showing three symbols of architecture, geometry, design and planning and skilled craftmanship. 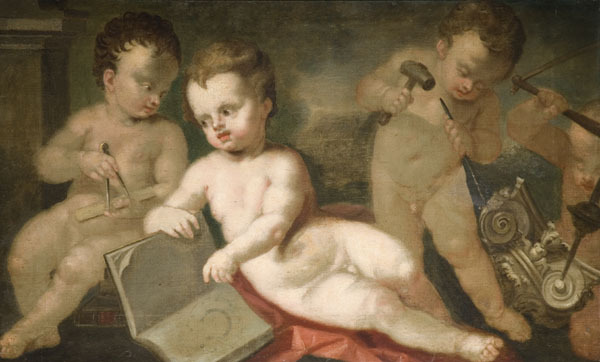 Description: Putti are often male figures resembling pudgy, human babies. Often naked and with wings, it is easy to confuse them with cherubs (angels) and cupids. It is thought that Putti exist to help Eros facilitate non-religious love. The symbols of architecture in this painting appear as geometry, design and planning, and skilled craftmanship.